There have been no surprises so far in the first day coverage of the Archbishop of Canterbury Dr. Rowan Williams' decision to retire at year's end. A little before noon London time the archbishop's press office released his resignation statement. Within the hour a Press Association interview and a background item for editors were released. Throughout the afternoon comments and appreciations from political and religious leaders came across the wires (really the internet) -- and from these sources the first day stories were formed. Rowan Williams has today announced he is stepping down as Archbishop of Canterbury but not before having a swipe at the 'dim-witted prejudice' against Christianity in Britain. But in a stark warning Dr Williams said 'ignorance' was damaging the church because too many people seem to oppose Christianity but 'don't know how religion works'. Granted the Daily Mail has a different demographic than the broadsheets, but the article continues in this herky-jerky manner, jumping from assertion to assertion. It has no focus, no sense of itself -- and no sense of the story. William Hill [a bookmaker] spokesman Graham Sharpe said: "Since Rowan Williams became Archbishop of Canterbury, John Sentamu has very much come to the fore and has been the best-backed contender to succeed him for some while, although Richard Chartres, the beaten favourite when Williams was appointed, is also a strong contender." I must admit that I would not have had a bookie's tout as my first quote. But the Sun is the Sun. Pretty nasty, and wrong. The assertion that "women’s ordination will lead onto the ordination of openly gay bishops" is questionable. The first woman bishop was the Rt. Rev. Penelope Jamieson who served as Bishop of Dunedin on New Zealand's South Island from 1990 to 2004. There are, or have been, women bishops in New Zealand, Australia, Canada, Cuba and the United States -- all predating the July 2010 vote by the Church of England's General Synod. In addition to its news reports, the Guardian offers five analyses pieces as well as a cartoon. The best is by Stephen Bates, the newspaper's former religion reporter. If you have time to read just one piece from all those I cite, read this one. While I do not share his politics, I have been a long time admirer of his work. His story is fair, thorough (irritating in places) but also heartfelt. He has sympathy for the subject of his article, but remains committed to telling the truth. In short, great writing. The archbishop's biographer, Rupert Shortt, has a weaker story. A fan of Dr. Williams, his article presents only one side of this complex man -- and also makes mistakes of fact when it moves away from the man to the issues. Soon after his move to Lambeth Palace, the [Dr. Williams] urged [the pope] to kick-start stalled talks on reunion between Rome and Canterbury. 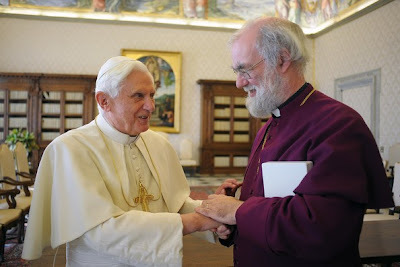 Benedict's condition for allowing this was that the Anglican communion should streamline its structures and start talking with a more united voice. Williams agreed; the covenant has formed a major element in his strategy. No, that is not how it happened. The Anglican Covenant arose from an internal Anglican document called the Windsor Report -- not from without. Yes, if the CoE fails to endorse it, it will be doomed -- the rest is questionable. The opponents who see the covenant as being too strict and "at odds" with the church's traditional polity are the liberals. It is also not supported in the more conservative parts of the communion -- the archbishops of the traditionalist coalition of Asian and African provinces last year said they could not support the covenant because it was too lenient. All of the pieces stress the archbishop's intellectual attainments -- his brilliance. Amelia Hill also saw it as part of the problem. From my experience in covering Dr. Williams for The Church of England Newspaper -- which is what it sounds like, though it is not the official newspaper of the church, there is no such animal -- Ms. Hill is correct. A number of Dr. Williams' blunders arose from his refusal to take advice. The Sharia law fiasco being the most notable among many self-inflicted media messes. Commentator Giles Fraser and the Guardian's editorial also damned him with faint praise. Fraser writes from the perspective of a liberal activist who has been let down by one of his own. One does not choose morality as one chooses cornflakes. So whilst his instincts may have been gay friendly, his increasing appreciation that the African church was dead against any accommodation with homosexuality made him side with the conservatives. He wanted a global Anglican community built around core values. And so, in effect, he became a split personality – with Williams the man at odds with Williams the archbishop. After the bitter Lambeth Conference of 1998, Williams, and several other bishops, made gay Christians a promise: "We pledge we will continue to reflect, pray and work for your full inclusion in the life of the church." Unfortunately, it was a promise he would fail to keep. My concern, however, is how those outside of Anglican or British circles will be able to follow what is going on. From simple issues (What exactly is the Archbishop of Canterbury?) to the complex, (Why is the archbishop disliked by the left when he is an admitted "hairy lefty"? ), these stories assume a degree of knowledge that is most likely not there. Even the British tabloid speculation as to who might be the next archbishop is based on an ill-founded assumption of how the process works. Newer PostPod people: Time for liberal Catholics to quit?